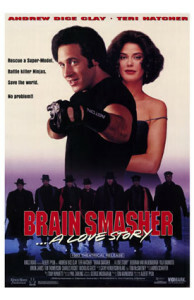 If you ever wanted proof that Andrew Dice Clay channelled all his energy and comedic ideas into The Adventures of Ford Fairlane then look no further than Brain Smasher… A Love Story. Here Ford – he will always be Ford – plays a beefy bouncer named Ed who tries in vain to wow us with dialogue and mannerisms obviously deleted from the 90s cult classic. With good reason. Ed meets ‘supermodel’ Sam (Teri Hatcher), a woman who has a thing. Red Monks want the thing. Apparently the thing is so important they send ninjas to get it. So Ed decides he will protect Sam and the thing from the ninjas to prevent the Red Monks from getting it and doing bad. That’s it really. The film is peppered with awful lines and disturbingly straightforward action, all set against a backdrop of a cheap TV show. No one here does themselves any favours. By making Ed a watered down Ford with muscles all Dice Clay does is make you wish you were watching Ford instead of this. Teri Hatcher is awful in a role I have no doubt she regrets, and in truth I cannot recall anyone else in the film. That or my subconscious is doing them a favour. I just wish it would go further and eradicate all memory of this lamentable effort from my tiny brain. Final Rating – 5 / 10. The only brains smashed in the this film are the ones who have to believe a young Teri Hatcher is hot for a rapidly expanding Andrew Dice Clay and his ‘Elvis via an aerobics instructor’ haircut.